Holly Shaw: One for Julie & Julia, please. Thank you. Except I actually used the automatic ticket thingie, so I really only said that to myself, in my head. After several weeks of longing to see Julie & Julia, eventually worrying that it would be yanked from theaters to make room for some silly sci-fi blockbuster (no offense), I decided today was the day. Before I left for the early bird special I sorted laundry into piles to show intent and then hit the road. Y'all. It was delightful. Perfectly charming in every way. My highly sensitive cheese-o-meter never went off, which says a lot. I loved Amy Adams and Meryl Streep, was of course, flawless (she lost a wee bit of credibility with me after Mama Mia, but earned it back because after all, she's Meryl). I have a whole new appreciation for Julia Child. I never knew much about her life, now I want to read a biography of this classy lady, who was also quite a hoot. I don't believe I'll ever master French cooking, or ever really attempt it, but I certainly appreciate her efforts. Her attitude, determination, zest for life and general spunky-ness were inspiring. I was also touched by the way they portrayed Julia's longing for a child, so honest and tender. And real. I also enjoyed the movie because of its link to blogging. The character (Julie) starts a blog to document her attempt to cook her way through Julia Child's cookbook in a year. Along the way she discovers more about herself and her relationships through blogging. I know my blog is just a small blip out there in the blogosphere, but it's my blip. I don't have a clear brand or specific purpose, like they tell you to have in order to find your niche and grow your readership. That's okay. My blog reflects me, my life, whatever that life happens to be at the moment, whether it's running (or not running), crafts, decorating, books, food, family or whatever. I want you to know how much it means to have you read my posts and share your thoughts with me. Whether you comment every single time, only when the mood strikes or not at all, I do appreciate you for visiting with me from time to time. So...thanks. I still had a little time before picking Annelise up at school, so I treated myself to a late lunch at Panera. Creamy tomato soup and half a chicken salad sandwich. Do you think Julia would say Bon Appetit? Well, I sure did. In the last precious few minutes I dashed into Barnes & Noble to buy the book Julie & Julia. I know, I'm a woman obsessed. I almost didn't buy it because the only copies they had were the irritating movie cover ones. I usually boycott those in a holier-than-thou-books-are-better-than-movies-snobby way. Today, due to a time crunch and a surge of instant gratification-ness, I swallowed my principles and bought it anyway. By the way, could my sunglasses be any larger? 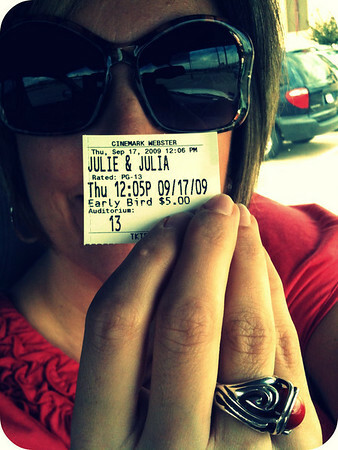 Yes, I loved Julie & Julia too and Panera Bread tomato soup - YUM YUM YUM! Sounds like the perfect afternoon. I haven't seen the movie yet but it's up there on my list of musts. I love your blog, Holly! I love it that you sorted laundry into piles to show intent before you went to the movies! I really enjoyed this movie as well and loved that it was about blogging too. You said it perfectly, "I know my blog is just a small blip out there in the blogosphere, but it's my blip." I feel the same way! I don't like books with the movie people on the covers either, I feel like it lessens the credibility of the book. I think I have given up seeing in the theater but will def. get it on Netflix. Hee-hee on the sunglasses you hollywood starlet, you. I had wanted to see that movie too. glad to hear it's good. I also hate to buy the books w/ the movie promo cover!